Ahoy there me hearties! It’s me again yer favorite app pirate ready for another adventure around the seven seas. The crew and I were on a weeklong break, just to relax and have fun. We hit the jackpot in the area that we found prior to that as we took home so many finds! And so the entire buccaneers decided to let loose and enjoy. One of the things that we did while on a break was snowboarding, which was a lot of fun. Since I still have a hangover on the freezing temperature of the mountain, I decided to write an app review that reminds me of that. The app is called Chilly Snow by Acid Cousins. 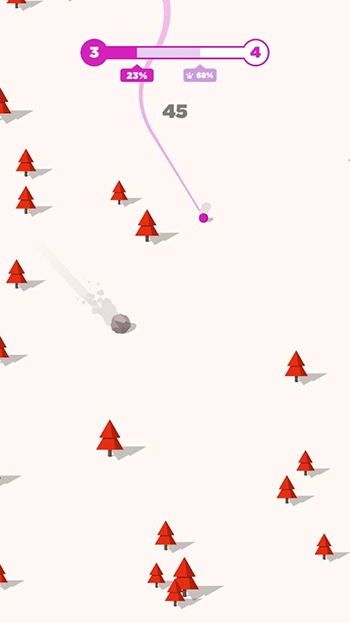 Chilly Snow is a casual game that works similar to endless runner apps. However, you are not running on this game, but instead you will be guiding the ball on its descent from the top of the snow covered mountain. The controls are pretty easy since the game will just require you to tap to move the ball left or right and hold for it to make turn in a curve. The goal is to stay as long as you can on the game to reach the highest possible score. There are no lives that you need to replenish, which is a good, especially if you are the type who want to continue playing as long as you want. The graphics of the game is nothing extraordinary. In fact, it is just very plain. There’s the mountain, the trees and the ball. That’s how basic it is. They are also not realistic. The colors of the tree and the ball could change after unlocking various achievements but it doesn’t really do much graphic-wise. Having more fun ball designs and more realistic environment could be an area for improvement. Considering that it is a free game, it is expected that it has advertisements. However, having a video advertisement play after every run without the option to close it can be frustrating. Even if you decide to spend over $3 to remove the ads, there are still advertisements that pop-up, which is even more frustrating. Chilly Snow can be downloaded for free. Although it has a paid option, you are not required to make a purchase to play it. It has simple controls and it lets you play as much as you want. The graphics are not attractive and there are too many advertisements that can be annoying. Ads still show up even after making the purchase. Chilly Snow is a free game that you may want to add on your titles if you are into endless runners or score as high as you can games. The advertisements can be too much though. If you do not mind that, then there’s a chance that you might enjoy this game, especially it can also be challenging.